Treat your loved one to a special dinner with this mouthwatering recipe from Lucca at Grand Velas Los Cabos. 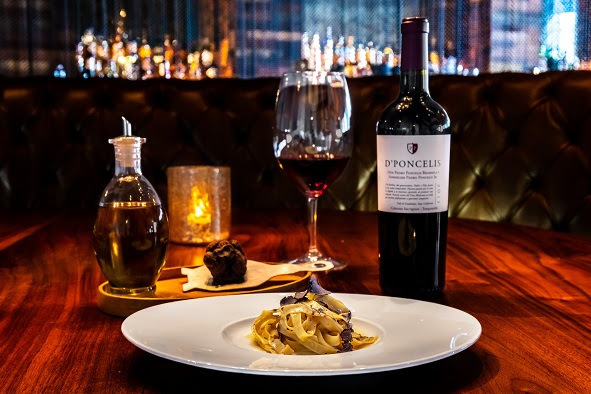 Executive Chef Antonio La Monica of Salerno, Italy created this dish which highlights the fresh winter black truffles from Italy, a perfect complement to the local extra virgin olive oil from Ensenada. Whip up this recipe at home using the below recipe. To make pasta: Form a mountain with the flour and semolina. Use your finger to make a crater in the center. Break the eggs into the hole, add a pinch of salt, and beat with a fork. Begin to incorporate the dry ingredients, stirring constantly. Once the mixture takes the consistency of cream, use your hands to continue incorporating the dry ingredients. Once incorporated, knead for about 10 to 15 minutes. The mass will become smooth and elastic. Once you can press the dough with a finger and it quickly recovers its shape, wrap it in cling film and let it rest in the refrigerator for at least 30 minutes. Dust your workspace with flour and taking a quarter of the dough, flatten it a bit with your hands. Pass the dough through a pasta roller machine, folding and passing again, closing the machine opening a bit with each turn, until you reach your required thickness. Pass the dough one more time through the machine with the Fettuccine cutter and then refrigerate covered. To make sauce: In a hot pan over medium heat, add half of the butter, the oil and the clove of garlic. Sauté. Add the truffle in the skillet and cook slightly.